Power Drain (Core Set F100)? effect to put it into play. Unlike other 'jumpers' you don't have to pay to put him into play, just wait on what is an all too common trigger. But others e.g. Black Dog, Dirk Sharpe go on to say that you can bring them into play committed to a story, enabling story phase shenanigans. Does the lack of this on the Fanatic limit his usefulness? However, you are still getting a decent enough card for free. Arcane icons aren't that common, and fast is always welcome. And a cultist to boot. I think it makes it into a lot of decks. I don't think it's a limitation, not coming into play committed, as you can still bring him into play and then commit him on the defence just like master of myths (and we all know how good he is). 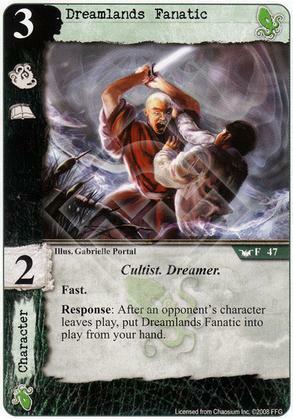 Cthulhu are the only faction that can make good use of the dreamer subtype so this card has 2 subtypes that can be worked with. Being able to jump in after a plague stone is awesome, as is ambushing and moving a dagger onto him (suprise 6 icons + fast). Really good card. Only a couple characters come into play committed, and Fanatic stays out instead of returning to hand. Nah, he's great. Fantastic. Getting an opponent's character to leave play isn't that difficult, either, especially in Cthulhu. Free alt cost, doesn't return to hand later, decent icons and more than 0 skill. Also playable in any deck, since you don't need a resource match on the alternate cost. Also is a Cultist for use with Temple of R'lyeh.